25 x Extra Large Whole Pigs Ears Very Popular Dog Chew Most Dogs Love. 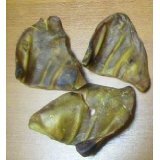 A grade Quality pigs ears, Natural Pork Treat that Has Been Air Dried For Dogs of all sizes and ages. Why not Buy Your Loved ones Some Now Before we sell out as they are a fast selling product. This sale is for 25 x large whole pigs ears from Petsupplyuk.com, there is lots of sellers out there who state they are selling whole large ears when only to find they are small cut ears, ours are whole large pigs ears and not small ones as others sell. Natural Pet Pig Ear Dog Chews are natural oven baked pig ears from the UK and other Countries, sure to be a hit with any dog. Our Pet Pig Ears are a full-sized, 100% digestible chew that is a healthy alternative to rawhide. Oven baked for great flavor and a chewy texture dogs will love sinking their teeth into this treat. No preservatives or added flavorings - just 100% natural pig ear.Each Pig Ear is approximately 5" x 4".Available in Single (1.3 oz), 10, 25 or 50 packs. Did you know that our bully sticks and other natural dog chews are much healthier than rawhide chews? Rawhide chews are hard to digest and can cause gas and stomach upset in your dog.Rawhide chews can be a choking hazard if your dog tries to swallow a large, partially chewed piece.Rawhide chews are often treated with bleach, dye and other harsh chemicals when they are processed.Rawhide chews are usually from cattle raised in feed lots where they are treated with antibiotics and growth hormones.Only Natural Pet Bully Sticks are from free-range cattle never treated with antibiotics or growth hormones.Only Natural Pet Bully Sticks contain beneficial nutrients such as naturally occurring glucosamine.Only Natural Pet Bully Sticks are great for dental health by helping to reduce plaque and tartar build up.Only Natural Pet brand products are 100% Guaranteed! Dogs have evolved over the millennia to be constant chewers. An active mouth is a healthy mouth for a dog, and regular gnawing behavior prevents gum disease and tooth decay. In addition to a clean mouth, chewing provides a sense of comfort and stress relief for a dog left alone or in an unfamiliar situation. But there is an alternative to coming home and finding chewed shoes and furniture: choose from several products to keep your dog's mouth healthy and his mind occupied.